"The government is at an all-time low while saying that it wants to re-engage in peacekeeping." Chief of the National Defence Staff General Walter Natynczyk inspects the Honour Guard at the Peacekeeping Monument during a ceremony in Ottawa in 2012. OTTAWA — The Trudeau Liberals may have promised to ramp up Canada's role in peacekeeping, but new UN figures show there were fewer Canadian peacekeepers in the field last month than at any point in recent memory. The revelation comes as Canada prepares to host a major peacekeeping summit in Vancouver next month, raising fears the country will be badly embarrassed unless the numbers start rising — and fast. The Liberals promised last summer to make up to 600 soldiers and 150 police officers available to the UN for future peacekeeping missions, but have yet to make any concrete commitments. The intervening year has instead seen a steady decrease in the number of Canadian blue helmets and blue berets deployed around the world, from 112 peacekeepers in August 2016 to 68 last month. Prime Minister Justin Trudeau speaks during a press conference in Toronto on Oct. 17, 2017. The Trudeau government has promised to re-commit Canada to peacekeeping. The decline is largely attributed to 44 fewer Canadian police officers being deployed to Haiti, where the UN is closing down its 13-year stabilization mission in favour of a much smaller effort. Walter Dorn, an expert on peacekeeping at the Canadian Forces College in Toronto who has studied the numbers, says the result is the smallest Canadian contribution to peacekeeping since at least 1990. By comparison, Canada's smallest contribution to peacekeeping under Stephen Harper, who made no secret of his dislike for the UN, was 88 soldiers and police officers in October 2014. "The government is at an all-time low while saying that it wants to re-engage in peacekeeping," Dorn said. "Its numbers are lower than the Conservatives ever were." Foreign Affairs Minister Chrystia Freeland's spokesman, Adam Austen, said the government remains convinced that Canada has an important role to play in peacekeeping and that it is committed to do more. Defence Department officials have drawn up a list of possible missions for the government to review, sources have told The Canadian Press, one of which would involve sending transport helicopters to Mali. While the Liberals reportedly hope to make a decision before the upcoming peacekeeping summit in Vancouver on Nov. 14-15, there is no certainty they will. The government has repeatedly said it will not be rushed into a mission, which Austen repeated on Monday, saying in an email: "We are doing this carefully and thoughtfully, as Canadians expect." But the UN expected last year when it agreed to let Canada host the peacekeeping meeting that Canadian troops would already be on the ground. The summit, to be hosted by Defence Minister Harjit Sajjan, is only supposed to be open to officials from countries that have made concrete pledges to peacekeeping missions. UN officials and foreign diplomats have expressed varying degrees of frustration and disappointment with the Liberal indecision over the last year, which Dorn echoed on Monday. "Not only has Canada not lived up to its promises, it has actually decreased its contribution," he said. "Canada is setting a poor example as the host for a pledging conference." RCMP Cpl. Kofi Gordon, left, who served as a peacekeeper in the Democratic Republic of the Congo and Haiti, and Sergeant Ron Rose, who served as a peacekeeper in Haiti, pose for photos at the National Peacekeeping Monument on National Peacekeepers Day in Ottawa on Aug. 11, 2013. The fact there are any Canadian peacekeepers in the field may come as a surprise to many people. 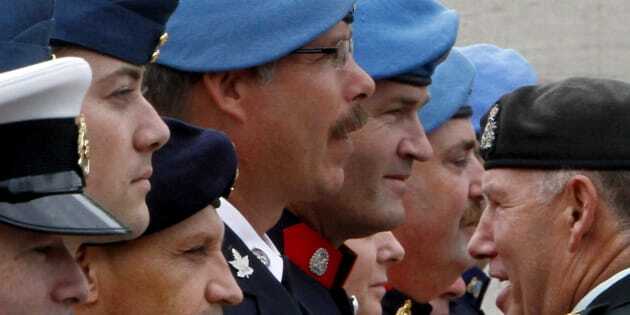 While the Liberals promised a return to peacekeeping during the last election campaign and again last year Canada has, in fact, continued to contribute soldiers and police officers to UN missions for decades. But last month's numbers continue a trend of declining participation that has seen Canada move from being one of the largest contributors to peacekeeping in the 1990s to the bottom half of the pack today. There has also been a gradual shift from deploying Canadian military personnel to police officers; of the 68 Canadian peacekeepers in the field last month, 40 were police.